Stop Worrying About SUI & Start Laughing Again, Thanks to Poise Impressa! A few months ago, we told you about Poise Impressa, a fabulous new way for women with SUI to feel confident while doing the things they love. Sadly, it wasn’t yet available in Canada. As of mid-February, though, that’s all going to change! Poise Impressa is coming to Canada! This is very exciting news for the millions of Canadian women who deal with SUI. What is SUI & How Does it Affect Canadian Women? SUI is an acronym for Stress Urinary Incontinence. Basically, it’s the medical terms for when you leak a bit when your bladder gets stressed out. Now, obviously your bladder isn’t stressing over money or that fight you had with your best friend. I’m not talking about that kind of stress! It’s more like pressure. Imagine a good, deep belly laugh or one of those whole-body sneezes! Your whole abdomen kind of squeezes, right? Well, that puts pressure on your bladder. For women with SUI, that pressure causes light bladder leakage. One section that really stands out is the emotional and social consequences section. 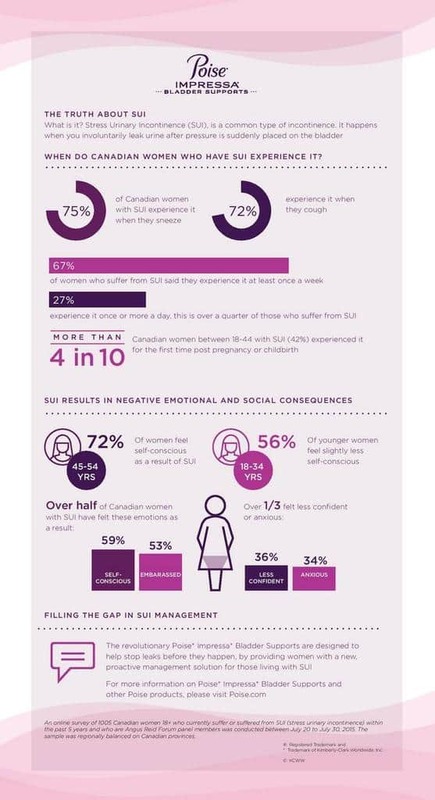 More than half the Canadian women surveyed feel embarrassed or self-conscious at times because of SUI. My friend Mrs. B (she opted to remain anonymous) was one of those women. Mrs. B. is in her late 30s and has three kids, all under age 10. She leads a very active lifestyle, and she’s always on the go. She loves to laugh with her kids, but often felt like she had to hold back on those deep belly laughs because of her SUI. She began to feel like she was letting it make her lose her great sense of humor! No one should be afraid to laugh. She tried out the Poise Impressa kit that I received. The sizing kit made it easy for her to find the right level of support that she needed. Poise Impressa comes in three sizes, each with a different level of support. Start with Size 1 and see how that works. If you feel uncomfortable or still experience leaks, then you go to size 2. The sizes are based on a number of factors, which is why it’s important to start with size 1. 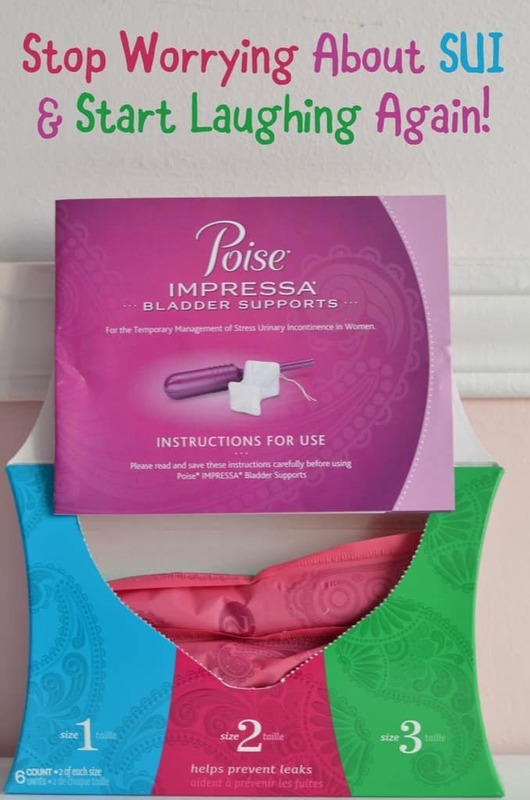 Mrs. B found the Poise Impressa Bladder Supports really easy to use. If you ever used a tampon, you’ll know how to use these. 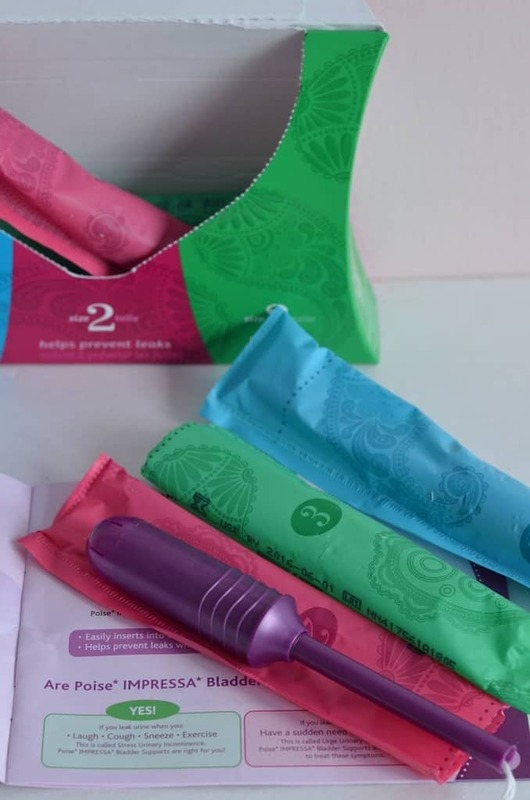 While they’re not tampons, the applicator is shaped similarly. Once in place, the Poise Impressa Bladder Supports place gentle pressure on your urethra, basically closing the gap when pressure is applied, like when you sneeze or laugh hard, so leakage doesn’t occur. The great thing about the Poise Impressa Bladder Supports is that once in place, you don’t even know that you’re using them. You can use the bathroom as normal, go about your regular busy life and just stop worrying about SUI. You can use one for up to 8 hours in a 24 hour period. Mrs. B isn’t alone in her praise of Poise Impressa. A whopping 9 out of 10 women who tried it said that it reduced or stopped their bladder leakage and that they would recommend it to others. If you’re dealing with SUI, watch the shelves of your favorite retailer in mid-February so you can pick up your sizing kit and start laughing again! Do you hold back on any activities because of SUI? What would you do more of if you didn’t have to worry about it? This post is brought to you by Poise Impressa. All opinions are our own. Stop Mom-on-Mom Bullying! Join the Sisterhood of Motherhood! I have tried these and they work great. I love that they are meant to prevent the leakage before it happens. I know someone who suffers from SUI, she tends to stay out of her usual yoga activities if she can’t keep it under control. She has been using poise for years to help manage that. It looks just like a tampon! I really feel for people who suffer from this silently…glad they are really trying to solve this for women! This product is great. I’m glad that they have come up with this product for women. This story makes me giggle, I don’t have this issue now but i know time may not be kind. I’ve birthed two kids and I know sometimes life happens. Glad to know they have it covered. My friend just tried these bladder supports and she loved them. It made such a big difference for her. 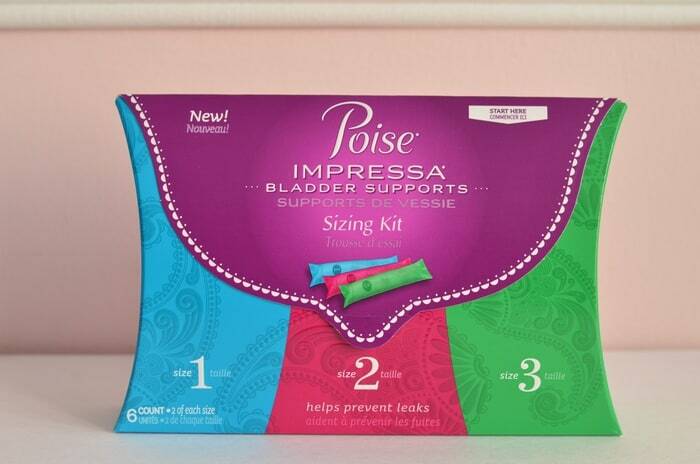 Poise Impressa Bladder Supports are going to change the life of many women. This is the first time I am hearing about these and I have some friends who could benefit from them. Thank you for sharing. I have heard of women using this and loved it but I have never tried it myself. My leak issue is still manageable. I think this is a great product for those who need it!! Who wants to worry when laughing?? Any product that keeps us free to laugh is a great product! I don’t know how any of us would make it through parenthood if we couldn’t laugh. 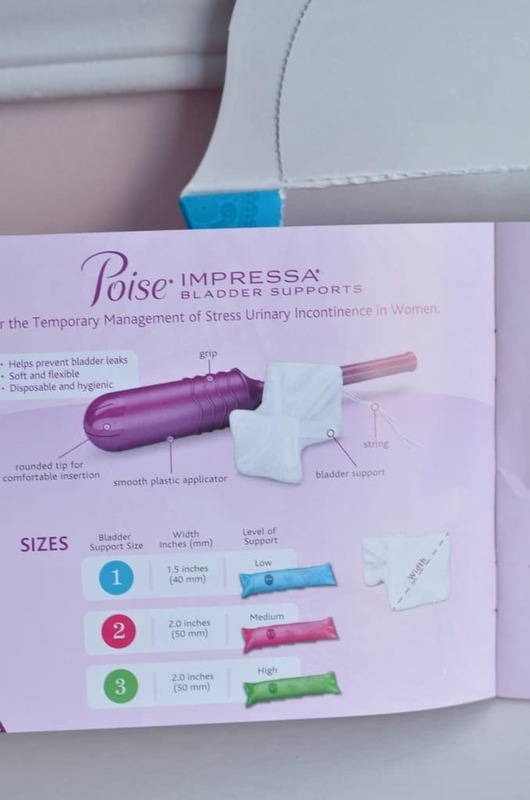 The Poise Impressa are an amazing product for women with SUI. They truly work and are a product every woman should try SUI. They will make you feel confident in knowing they are protected. Thankfully i don’t have a leak issue, I’m so glad to have Impressa bladder support it really helps to those uncomfortable women. I think this is great that there are products like this now, and that they are openly discussed. It takes away the stigma and allows women to actually find products that help them. I know this has been an issue for many women. It is very inconvenient to have SUI. It’s great that Canadian women can get this product. I’m sure it will help women with SUI feel more comfortable. I don’t have this problem, I do have a LBL but it’s usually when I’m running or jumping. I’ll have to check into this and see if it work for that too. I have never heard of SUI. Glad you shared this knowledge. I may be able to pass it on to someone who truly needs it. When Can You Take a Pregnancy Test?